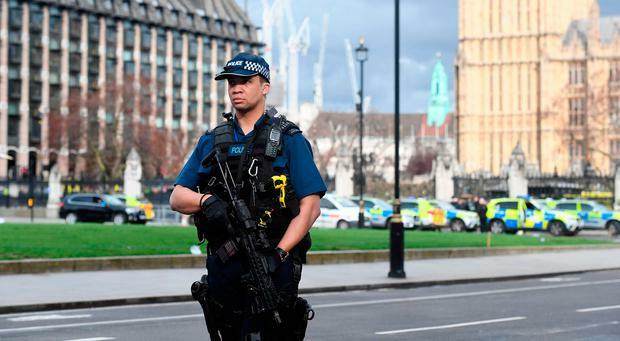 A video posted on social media claims to have captured the aftermath of the attack close to the Palace of Westminster. Radoslaw Sikorski posted a video to Twitter purporting to show people lying injured in the road on Westminster Bridge. Mr Sikorski, a senior fellow at Harvard Centre for European Studies, said he saw at least five people lying on the ground after being "mown down" by a car. "I heard what I thought what I thought was just a collision and then I looked through the window of the taxi and someone down, obviously in great distress," he told the BBC. "Then I saw a second person down, and I started filming, then I saw three more people down, one of them bleeding profusely." Alex Wafer, 47, who was cycling nearby and saw the aftermath, said: "At the end of the embankment it appears as though there is an ambulance. "It looks as if they are treating somebody. Just below, it looks like there may be another paramedic treating someone else." Kevin Schofield, the editor of PoliticsHome.com heard "a very loud bang" from the press gallery inside the Houses of Parliament followed by lots of shouting and men running around. He told Sky News: "Someone rushed through, attacked a policeman, a policeman went down, another policeman came and he was rescued. "The man who had assaulted him got up and he appeared to be carrying either a knife or a gun. Then we heard gunfire, lots of gunfire, maybe five or six rounds. "All I remember seeing is the man approaching the police officer probably with a knife and then there was gunfire. "He was walking towards a second policeman with his arm outstretched, with what looked like a knife in his hand, having already assaulted another policeman. "It was at that moment that you realised that something serious was happening - a man had broken in to Parliament and had a weapon." "I saw a thick-set man in black clothes come through the gates into New Palace Yard, just below Big Ben," he told the BBC. "He had something in his hand, it looked like a stick of some sort, and he was challenged by a couple of policemen in yellow jackets. "And one of the yellow-jacketed policemen fell down and we could see the man in black moving his arm in a way that suggested he was stabbing or striking the yellow-jacketed policeman." He added: "As this attacker was running towards the entrance two plain-clothed guys with guns shouted at him what sounded like a warning, he ignored it and they shot two or three times and he fell." A man who did not want to be named said: "I just happened to be passing through Westminster Square. "I heard shots and at about the same time saw a car that seemed to have mounted the pavement outside Parliament." Fighting back tears he said: "We were just walking up to the station and there was a loud bang and a guy, someone, crashed a car and took some pedestrians out. "A guy came past my right shoulder with a big knife and just started plunging it into the policeman. "I have never seen anything like that. I just can't believe what I just saw." 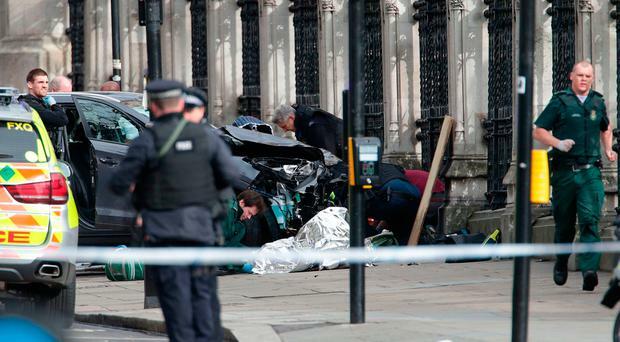 Alan Parry, of Sky Sports News, was at Westminster for a meeting when he heard "an almighty crash" when he was just outside the underground station . He could see what he thought was a 4x4 vehicle on the other side of the road which had crashed into some railings. He told Sky News: "There was smoke coming this vehicle. I walked on a few paces further and saw what I assumed to be either a pedestrian or a cyclist who had clearly been hit and wasn't moving, although he did then gently move. "The guy who I assumed was the driver of this 4x4 got out of the car and suddenly sprinted away from the scene - that was followed by four of what sounded much like gunshots. "All of a sudden all hell was let loose. Police descended everywhere and the whole area was locked down."